How to get that velvet-suede look for entremets? 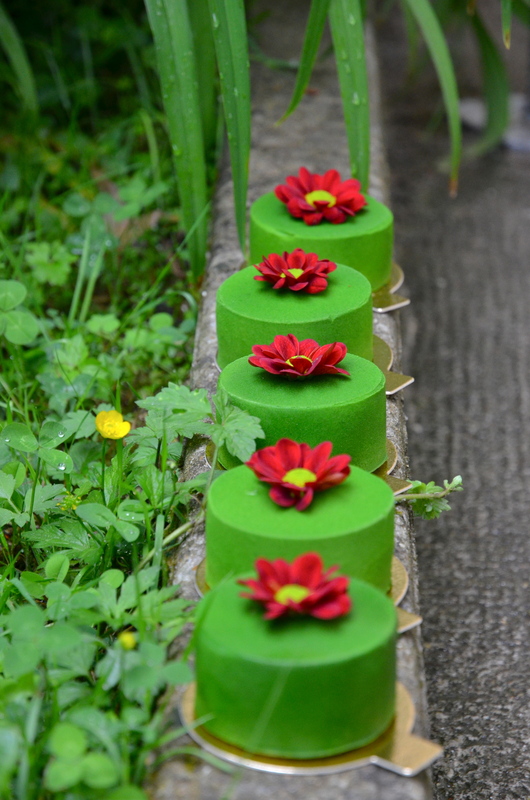 Above photo: Petit gateau entremet “GARDEN VELOUR” by Miss Pirisi. How to get that velvet-suede look for entremets without going to big expenses and buying huge machines to pulverise you out of your small kitchen? The velvet-suede look for entremets & petits gateaux I’ve noticed is being adopted by patissiers who want a more modern/contemporary look. Take La Patisserie by Cyril Lignac who’s choosing this style over a wet glacage. As we did in Ferrandi we used a pistolet, a spray gun which is attached to a noisy machine. I hate this thing but I love the effect it gives. It creates noise and a big mess. So when I found out there is the spray can with the exact ingredients of cacao butter and food colouring I was immediately curious to know if it would give the same effect. The brand I use is Deco Relief. You can buy Deco Relief from A.Simon, Mora and the shop itself Deco Relief, all shops are on Rue Montmartre in Paris. The sprays are a range called Perlé Velours and come in shades of chocolat, white, caramel, yellow, red and green. Now, pay attention to the can sizes and what’s in them. The smaller cans are 150ml and are just over 17 euros, red, yellow, green & white contain cacao butter. This is the best choice. There are the larger spray cans for the same price but vegetable oil not cacao butter why it’s cheaper. 1. Put the spray can in a double boiler. I put directly into a pot of water, keeping the heat on low and covering half the can. The temperature should be between 40-50 degrees for 30 minutes. (You can really only go ball-park with this, who knows what the real temperature is inside the can). 2.Shake the spray can for 2 minutes. (Less if you want, makes no difference I find). 3. Do a test spray holding the can upside down. Make sure you spray against cardboard, or paper, something other than you or the wall. 4. 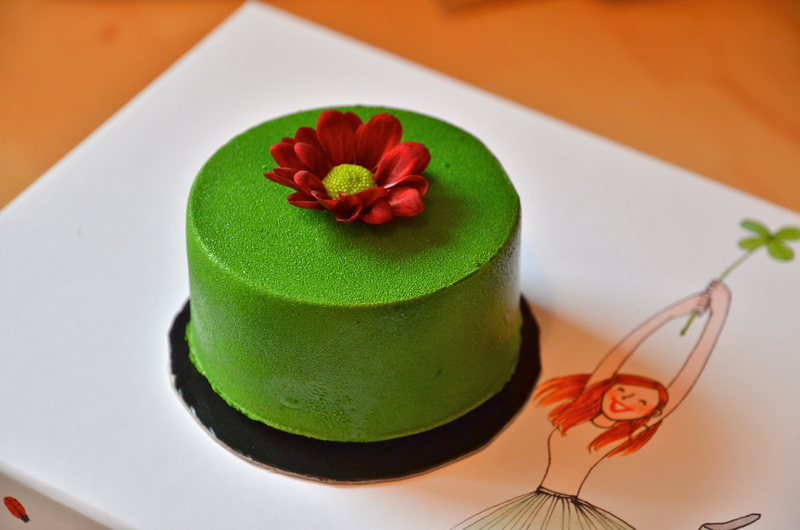 Spray entremets only when they are directly out of the freezer. The thermic shock gives that powdered effect. I looked on the Deco Relief website and they say to have a delivery you need to spend over 250 euros. So, if you live in Paris the best choice is to go directly to any of the above mentioned stores. 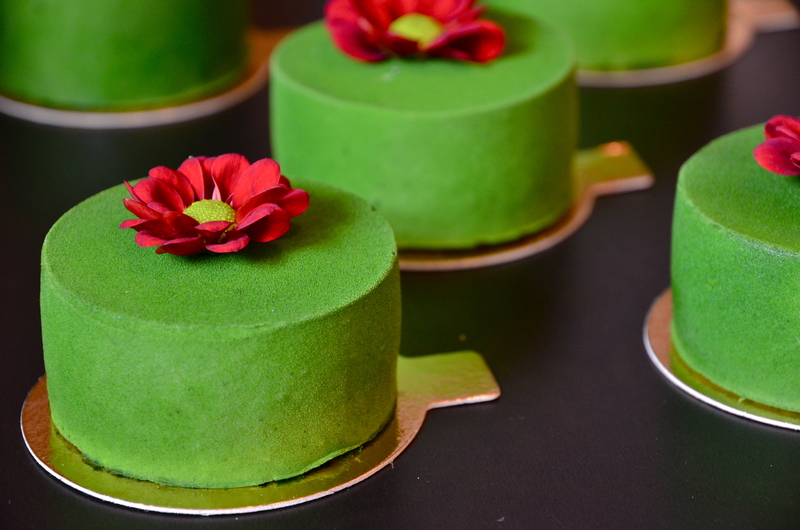 VELOUR GARDEN petit gateaux is made up of a pistache sponge base, vanilla cream with an oozing centre of raspberry confiture.